Os cientistas dispôem de uma mala cheia de conhecimentos da Lua, ao contrário, têem uma mala vazia de conhecimentos da Crosta terrestre marinha ao centro da terra. Na imagem é visível o furo rectangular, (12x22m) para lançamento dos tubos, sem ser afectado pela ondulação do mar . Ponto 14 da descrição geral. 1-entrada, 2-salva vidas, 3-azimute propulsor, 4-ponte de comando, 5-heliporto, 6-instalações dos tripulantes tais como jacuzi, ginásio, sala de conferências, sala de convívio, cabines, sala de vídeo/cinema, sala de refeições etc., 7-torre de perfuração, 8-andar técnico de perfuração, 9-laboratório, 10-guindaste, 11- zona dos tubos de perfuração, 12-zona de circulação das lamas provenientes da perfuração, 13-sala das máquinas, 14-furo rectangular, (12x22m) de baixo da torre de perfuração, para lançamento dos tubos, 15-equipamento de perfuração. A formação da Crosta do Oceano é um processo chave no ciclo das placas tectônicas que conduz aos terramotos e formação dos vulcões. O programa de perfuração integrado do Oceano (Integrated Ocean Drilling Program-IODP) é um programa de pesquisa marinho internacional dedicado à compreensão científica da Terra. Sustentado por um consórcio europeu composto por 17 países e da República Popular da China. Caso pretenda, posso disponibilizar o link da simulação de perfuração efectuada pelo citado navio. D/V CHIKYU uses GPS positioning data from satellites and an acoustic positioning system that communicates with transponders on the ocean floor, to specify its position and measure the forces acting on the ship (wind, wave, and current direction and speed). Those data are used to predict the direction and speed at which the ship could deviate from its position. 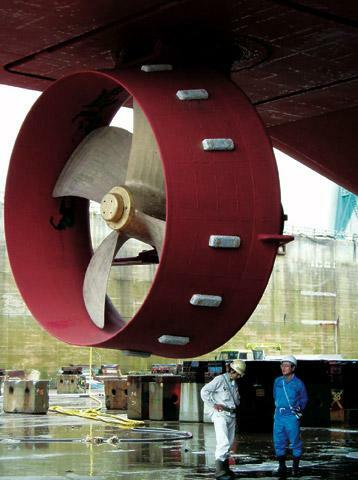 Based on those predictions, computer-controlled thrusters (huge propellers that can rotate 360 degree) apply counter-thrust in opposition to that deviation to hold the D/V CHIKYU in position. 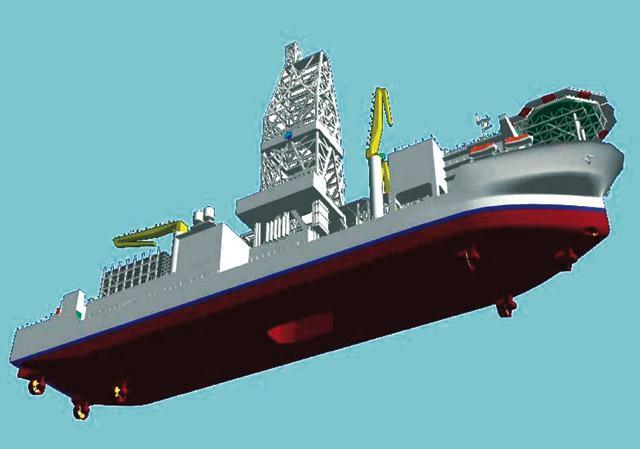 D/V CHIKYU can continue drilling for months or a year in surface currents up to 3-4 knots, wind speeds of up to 23 meters per second, and wave heights of up to 4.5 meters. 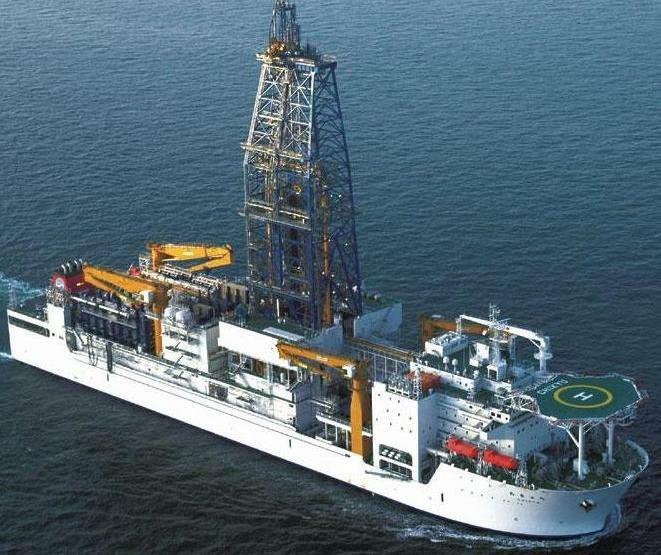 D/V CHIKYU is a first riser equipped science drill ship to reach the deeper part of the Earth. What is the difference from the previous scientific drilling? Why does D/V CHIKYU can drill such a deep part? We approach to the mystery of the drilling ability of D/V CHIKYU. D/V CHIKYU has a riser drilling system, which has been used in the oil and gas industry. For scientific research applications it is the first time to have such a system. Riser pipe guides the drill pipe for reentering to the well, and downhole measurement tools and devices for lowering and setting in the hole. is the artificial drilling fluid, which is chemically and physically composed. Mud is circulated from the drilling vessel by using high pressure pumps onboard down through inside the drill pipes, and returns up the annulus between the drill pipe and the borehole, the casing and riser pipe to the vessel. There are multiple benefits of the riser drilling with having the mud circulations while drilling and of the borehole itself. This is the major key when drilling to depths thousand of meters below the sea floor. Further Blow Out Preventer (BOP) makes safe drilling even where there is unexpected high pressure flow of gas, oil or other formation fluids from the well. * Lower large diameter of measuring/monitoring devices, not limited to the inner diameter of the drilling pipe. * sample drilling cuttings (scraped formation particles) on board to evaluate formation layers. The cylindrical rock and sediment samples taken from the deep Earth is called and it is a key to find the figure of the Earth, however, the core is a living materials and its nature changes every moment due to environment difference. D/V CHIKYU equips with the onboard laboratory for competent, complex and quick analysis. The 9 meters long core samples moved from the drill floor through catwalk are cut into sections of 1.5 meters in length. Each core section is provided an ID barcode (indicating the expedition number, drill hole number, core number, and section number). These data are stored in the database. It measures CT value of whole core and construct inner view of the core, before the core is distracted its physical property and structure by cut to half. To measure inner heterogeneity of the core, this device provides more information for using sample more efficiently and effectively. 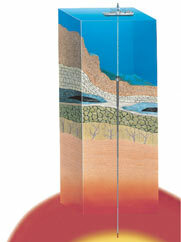 In the study of microbiology and geochemistry, gases and fluids are important samples as well as solid core. Therefore, high quality gas / fluid sampling is required. The QA/QC Sampling Room enables non-contaminated sampling in anaerobic atmosphere. Subsurface microorganisms are living in a low temperature and anaerobic environment, which can be killed or mutated by long-time exposure in the aerobic environment under room temperature. Microbiology Lab. provides various equipments for sampling and storage for subsurface microorganisms such as anaerobic glove box, freezer (under -80 degree C) and incubator. Split a 1.5 meters long whole core into working and archive halves. Working half is for distributed to researchers as discrete samples for on-board and onshore analyses. Archive half is for stored in a core case for permanent archiving after description and non-destructive physical property measurements (density, magnetic susceptibility...etc.). Discrete samples taken from the working half core are purified for each analysis by centrifugal separation and/or filtering. High precision residual magnetization measurement of the core is done in a magnetic shield room, for age determination and paleo-environmental research. Microscopic observations are done for paleontological / petrological studies such as fossil age determination, paleo-environment, petrogenesis and crustal environment. Direitos reservados. Este site promocional constitui propriedade intelectual do autor e não pode ser reproduzido total ou parcialmente sem autorização do autor, sob pena de punição de acordo com a legislação em vigor. Copyright © 2005-2006 Paulo Farinha. All rights reserved.